Among the more alarming aspects of Donald Trump’s election is that he will soon have command of thousands of nuclear weapons. This poses a new and unknown threat to global peace and security, but it also provides an urgent incentive for all states to join the humanitarian initiative to ban nuclear weapons. The humanitarian initiative is a group of states and civil society organisations working towards a ban on nuclear weapons. For the last five years, the group has made steady progress towards this goal. Unfortunately, states that have nuclear weapons, or states that seek protection under a so-called nuclear umbrella, have largely opposed a treaty banning nuclear weapons. This includes nearly all NATO members, as well as Australia. Trump’s access to nuclear weapons raises three major concerns. Firstly, and not to be taken lightly: Trump is highly unpredictable. Western-allied states seek to frame the issue of the nuclear weapons as a threat from an unpredictable “other”. In this telling of the story, only “unhinged leaders” such as Iran’s Mahmoud Ahmadinejad, North Korea’s Kim Jong-un, Russia’s Vladimir Putin, or terrorists would be willing to use nuclear weapons. By contrast, the US casts itself as worthy of nuclear weapons due to its stable, law-abiding and trustworthy leadership. But throughout the election campaign, Trump came across as irrational, hypersensitive and prone to threatening those with whom he disagrees or disapproves. He revealed his inconsistent beliefs and false claims about basic truths, and willingness to change these beliefs for votes on a whim. Of course, whether it is under President Obama or President Trump, the US is capable of launching, within minutes, a nuclear attack that could threaten the extinction of human life on Earth. But with Trump, it is nearly impossible to separate empty braggadocio from genuine intention. That means we must take special precautions; Trump has done nothing so far to dispel fears he will apply his reckless brand of decision-making to nuclear weapons. Can I be honest with you? It’s going to happen, anyway. It’s going to happen anyway. Proliferation is only inevitable if presidents like Trump shirk their obligations to non-proliferation, and continue to rely on nuclear deterrence instead of making genuine efforts towards disarmament. The US has an obligation under the Nuclear Non-Proliferation Treaty to not encourage any non-nuclear weapon state to acquire nuclear weapons. 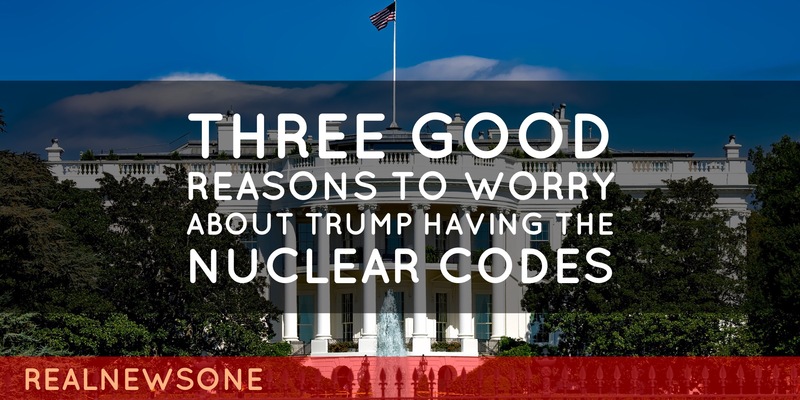 But some of Trump’s confusing comments on the topic could be interpreted as encouraging the acquisition of nuclear weapons by Japan, South Korea, and possibly Saudi Arabia. He has also promised to “rip up” the US’ commitment to the 2015 deal to lift sanctions on Iran in exchange for that country limiting its nuclear activity. This agreement makes the Middle East, and world, safer. Nine states currently possess 15,000 nuclear weapons. The latest estimates indicate that Russia has 7,300; USA, 7,000; France, 300; China, 260; United Kingdom, 215; Pakistan, 130; India, 120; Israel, 80; and North Korea, 10. More states with nuclear weapons further increases the chance of a nuclear war. It encourages a new Cold War style nuclear arms race, and increases the likelihood of terrorist groups procuring nuclear weapons grade materials. The third dilemma posed by Trump’s access to nuclear weapons is his utter contempt for and ignorance of international law. He has advocated the direct targeting of civilians during war including families, endorsed the use of torture and lamented that torture techniques are too soft, and confirmed that he would enforce the commission of war crimes by the military. Although he has since partially retreated from some of these statements, it seems he still advocates the use of torture and the contravention of international law in the interests of the US. The evidence of the horrific humanitarian impact of nuclear weapons should be motive enough for any state to support a nuclear weapons ban. Nuclear weapons don’t just kill people in a blast. They also cause cancer in survivors – and their children and grandchildren. The risk of a nuclear weapons detonation is real and, statistically, increases over time. If a nuclear bomb was detonated there is no organisation or government on Earth sufficiently prepared to deal with the deadly consequences. But if states remain unconvinced, a Trump presidency should present a final and decisive incentive for all states to support a humanitarian ban on the use of nuclear weapons.